Haptic feedback is a major component in this new technology invented at the University of Tokyo. HaptoClone is a new creation from researchers in the Shinoda Lab at the University of Tokyo that can let you practically feel what isn’t actually in front of you. It at least gives you the illusion that you’re feeling it. The technology is trippy in theory, but in practice it very well may lead to a more personal level of communication through our smartphones and computers – or dare I say more intimate. Right now HaptoClone works through two giant cubes. 1,992 ultrasonic transducers are lined up along the sides of the cube and sense omni-directional and volumetric forces all around. Something called converged ultrasound provides the haptic feedback. Then it’s just a matter of replicating the force. So if one person sticks a hand in one cube and another person sticks a hand the other, it can feel like you’re touching each other. The visual, or “optical light field,” is reproduced in the cubes using a simple mirror trick. It doesn’t end at just a mere touch though. Alissa Walker of Gizmodo reports that during her time experimenting with the tech, she was able to swat at a ball in the other cube. She watched as it reacted to her force swaying and jittering. Imagine down the line having smartphones with these sensors built in, so you can reach toward the screen and touch someone during a video call. It must be an incredible feeling to be able to touch your child’s hand or perhaps get a bit touchy-feely with your lover when you’re far away on a business trip. The technology still has a bit of a journey ahead before it’s ready to hit mainstream. Our obsession with making gadgets tinier and slimmer poses an issue for HaptoClone as it currently requires two enormous boxes and thousands of transducers. Plus, the technology can’t replicate the textures of the cloned object, so it’s not quite like feeling the real thing just yet. For now, at least check out the demo Shinoda Lab uploaded to YouTube. 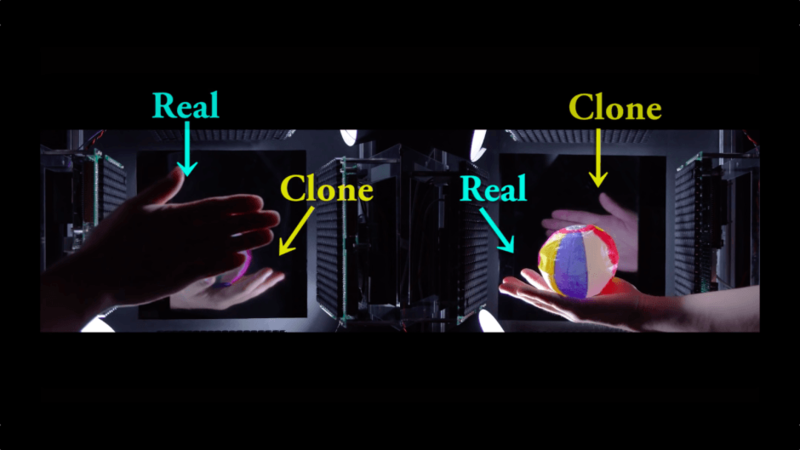 It looks like an incredible illusion, but this is real technology at work.